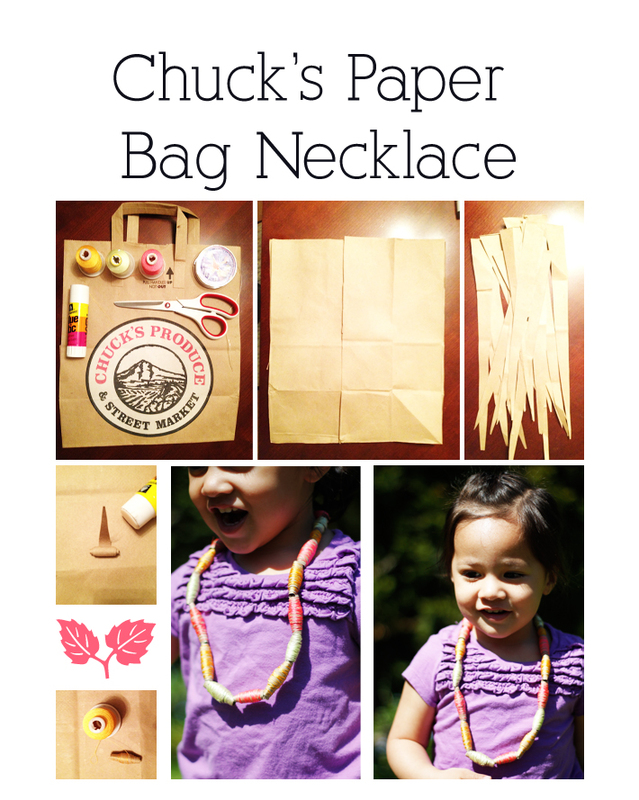 We always have a few extra Chuck’s Produce bags and my daughter has been really into wearing anything and everything around her neck as a necklace. I wanted to make her something that I would feel bad about her breaking or get hurt breaking. When I was cutting the bag I used only the sides, front and back, the bottom of the bag has several folds and glue. I just cut several long triangle Strips, they were not measured out perfectly I just eyeballed it making the triangle strips a little more organic looking, this also is a time saver. When making the beads I glued the whole strip only placing glue on the inside and rolling the paper up. After I had all the strips rolled up I then glued the whole outside of the bead and wrapped it with embroidery floss. Then I just added the beads to the string and was able to hide the knot inside one of the beads.